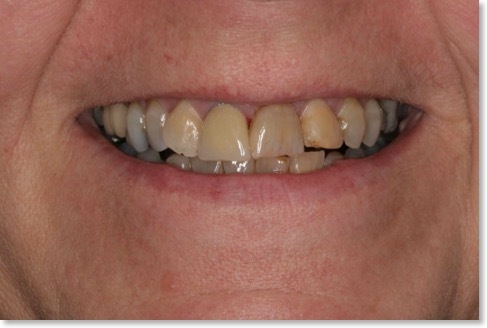 This case shows a 2 tooth denture replacing the upper central incisor teeth. 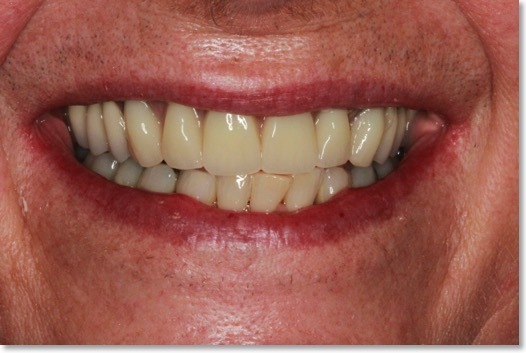 The patient disliked the denture and came to see me to consider implants as a permanent replacement. 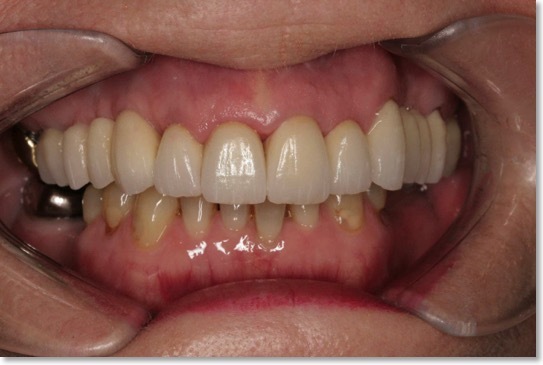 Two individual dental implants were placed in the central incisor positions and you see the Zirconia abutments fitted that retain the fixed crowns. 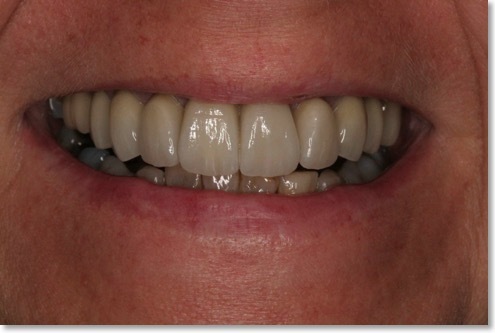 The layered ceramic crowns are permanently bonded to the zirconia abutments as two individual teeth. 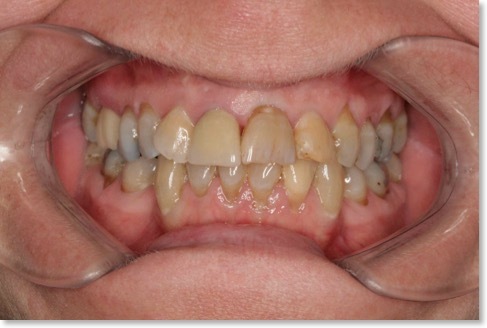 Flossing is possible between the crowns just like natural teeth. 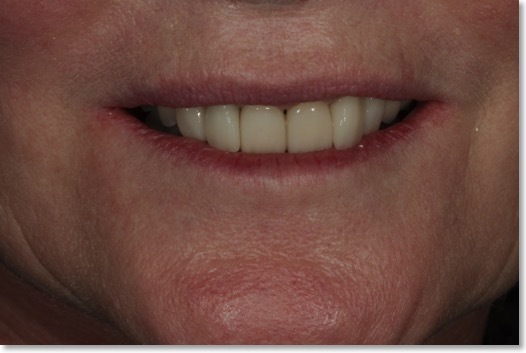 Final result showing harmony with the smile and lip line. 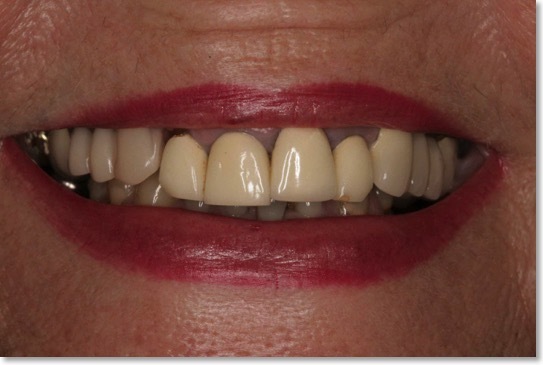 the after pictures here show how the misshapen teeth have been transformed with natural looking crowns and veneers. 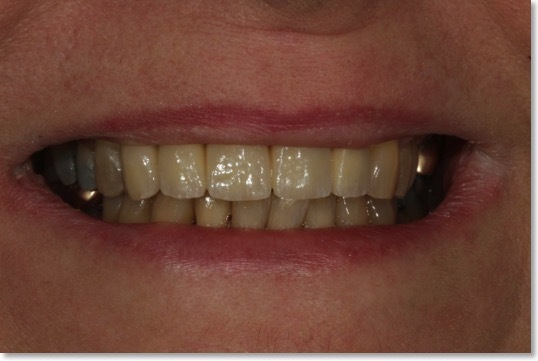 The upper right central incisor was replaced with a single tooth implant, zirconia abutment and matching cosmetic crown. 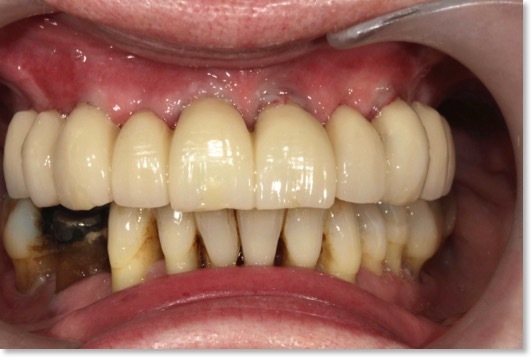 Important points to note here are the zeniths of the central incisor teeth which match each other perfectly. 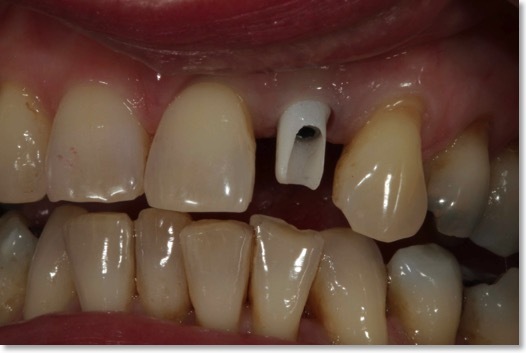 This can be very hard to achieve when a natural tooth is next to an implant. 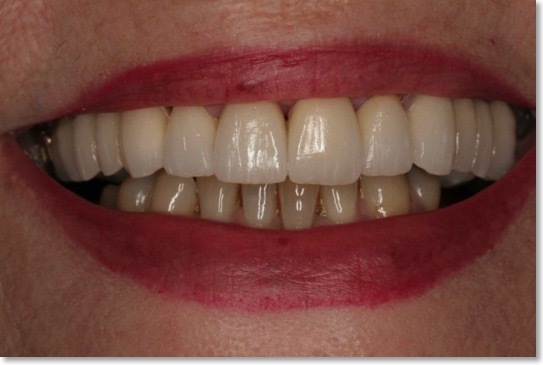 The shade and characteristics chosen reflect a natural look and the patient was particularly keen to avoid a false or overly white result. 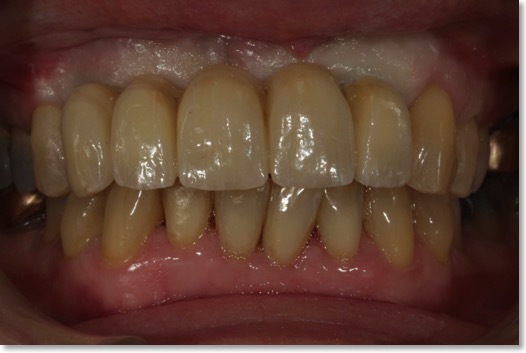 this missing single lateral incisor was replaced with a dental implant and restored with a zirconia cad cam abutment and single cosmetic ceramic crown. 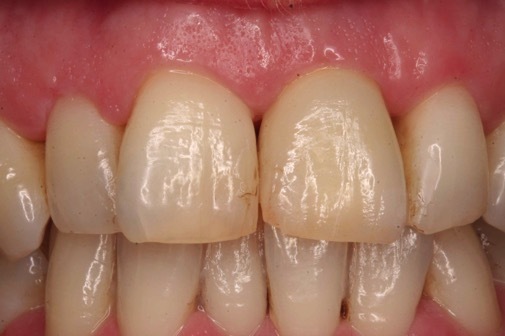 Natural shades and characteristics were incorporated into the crown to blend with the untouched adjacent teeth. If you look closely you can see many gradations of shade within even just a single crown. 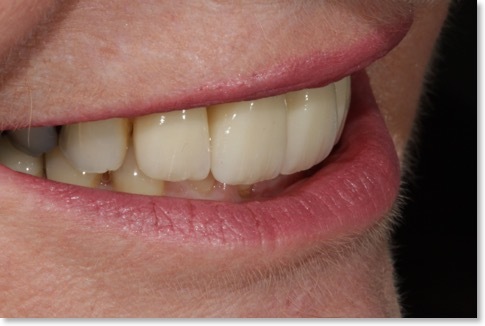 Natural teeth have these features so we strive to copy them in our cosmetic restorations. 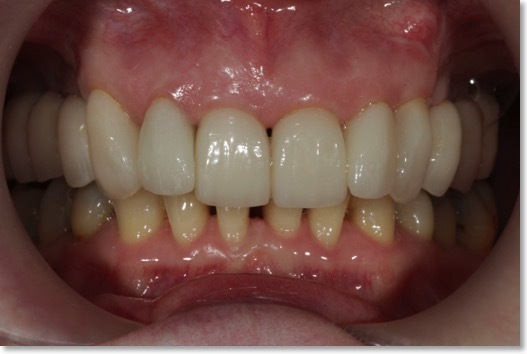 Particular attention was paid to replicating the natural height and contour of the gum. 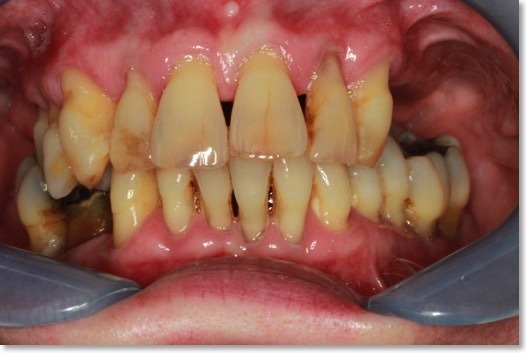 If not done properly, gum levels can rise on implamnts and fail to match the adjacent teeth. I always aim to place the gum level at the correct height where possible. 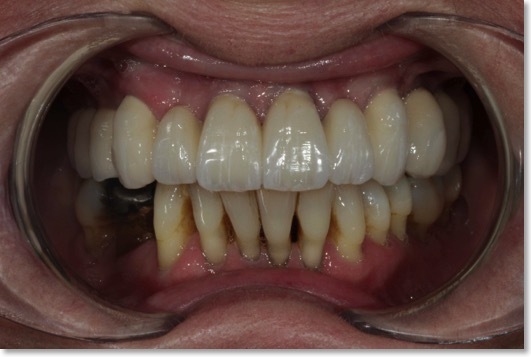 This very challenging case shows how it can still be possible to perfectly match a single central incisor implant and crown ensuring that the gum level and aesthetics are perfect. 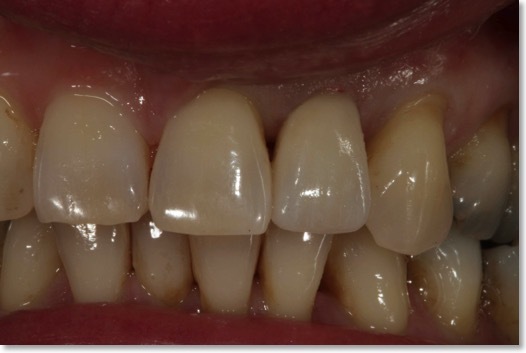 I ensure that every detail about the crown is a faithful reproduction of the natural tooth including shape, shades and surface textures. You will also notice how the gum level is perfect and displays health. 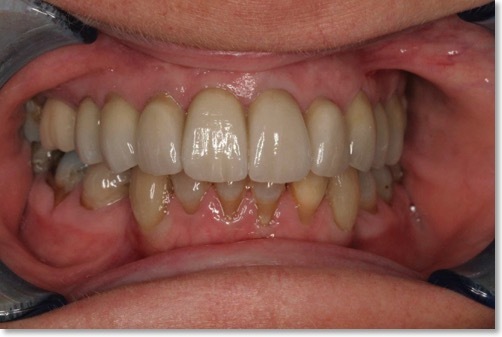 In order to create a tooth that matches the adjacent one for length and gum level, bone mineral was added. 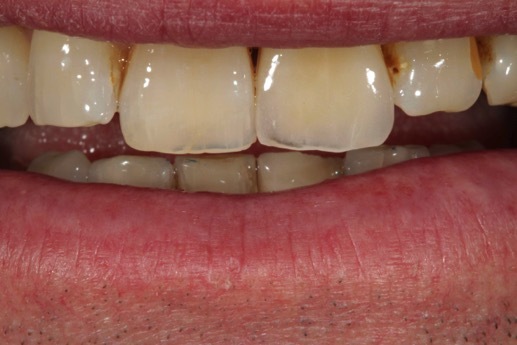 This after picture was taken 1 week after the crown was fitted and as the gum matures, the profile will continue to improve around the neck of the tooth. 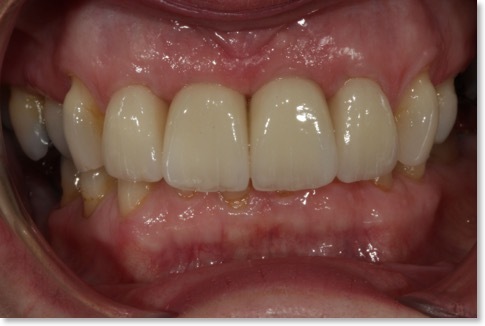 This case shows a failing set of natural upper teeth replaced with an immediate implant bridge. 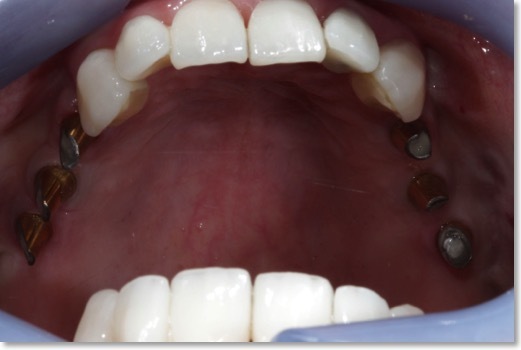 The second picture shows the immediate provisional bridge in place whilst the implants healed with the bone. 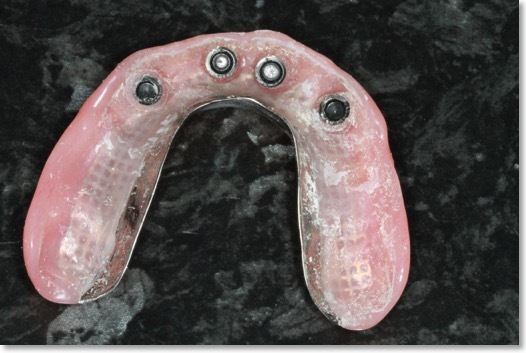 After this was fitted onto an initial 4 implants, 6 further implant fixtures were placed to support upper back teeth implants. 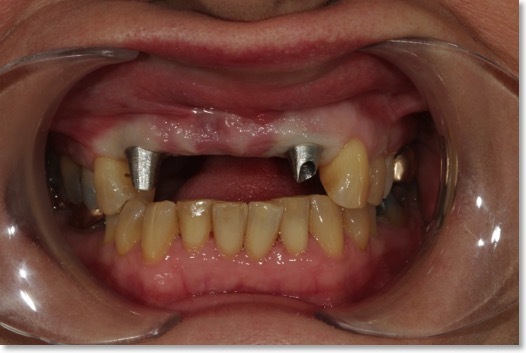 The final upper jaw had 10 implants in place, 4 at the front and 3 either side at the back. 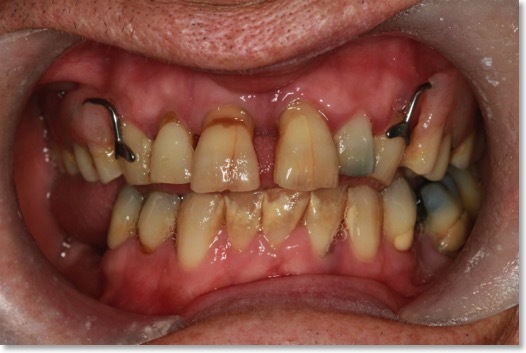 This number was necessary as additional sinus grafting was necessary and ideally one implant per toot is used at the back of the mouth in such cases. 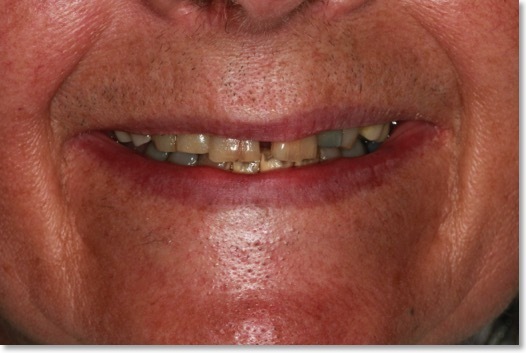 The total treatment time was around 9 months and again it was the sinus grafting that dictated the timescale. 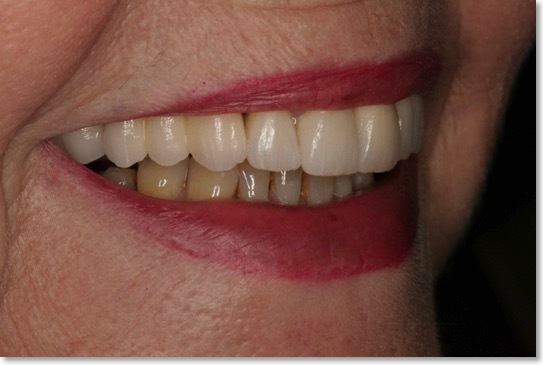 Again in this case, as the patient was in her late 60’s she wanted a very natural look to the teeth and requested features that were sympathetic to her age. 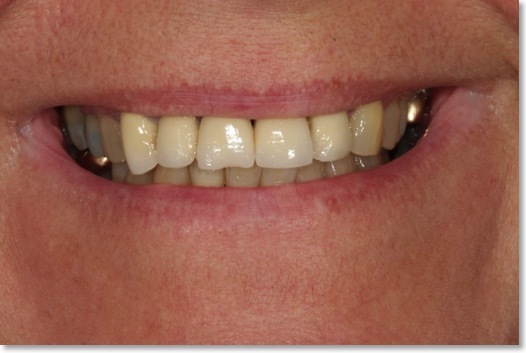 All of the upper teeth shown in the above picture were created from ceramic and fitted to the implants. 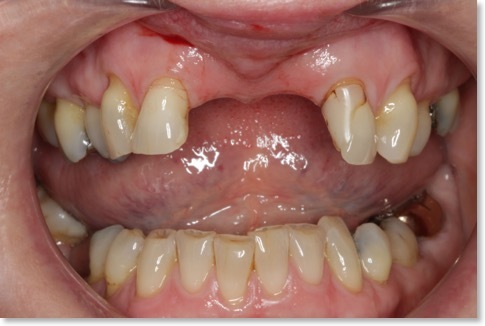 The lower teeth are the patient’s own. 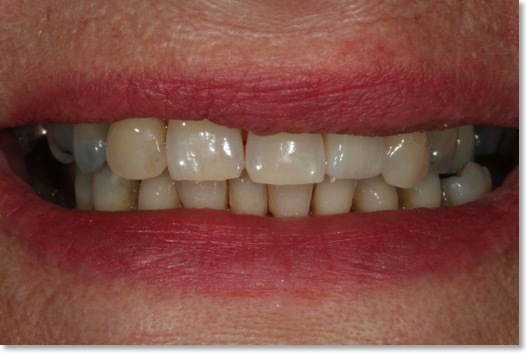 The final result reflects the patient’s wish list for a healthy fresher look that still looked natural and not out of place given her age. 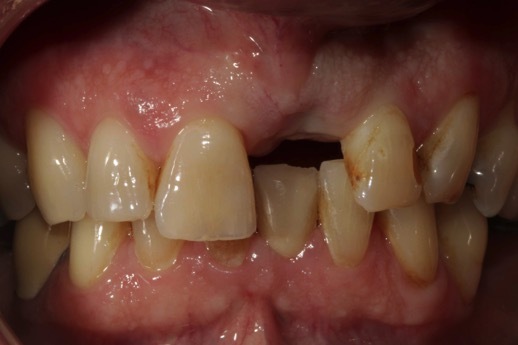 This case was referred by a dentist who had tried hard to save the patient’s teeth over many years. 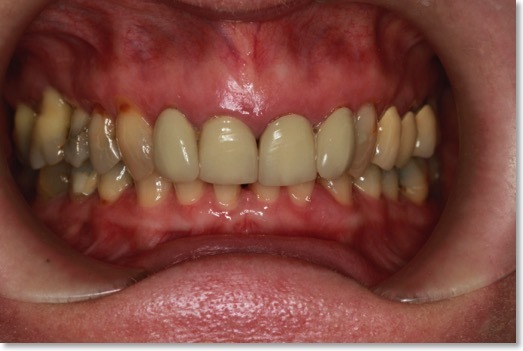 She had suffered gum disease of the upper back teeth with significant bone loss. 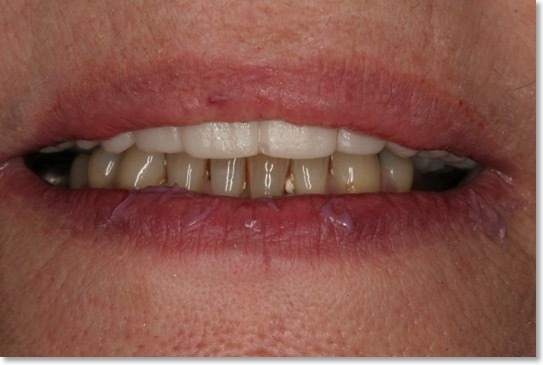 The patient was also unhappy with the appearance of the old crowns on her front teeth. 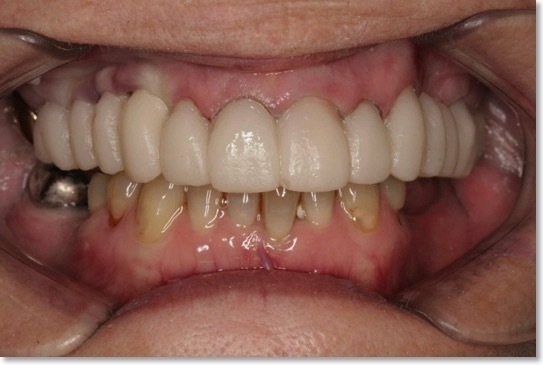 A comprehensive plan was formulated to remove the failing upper back teeth, grow new bone using sinus grafting then place implants to replace the missing teeth. 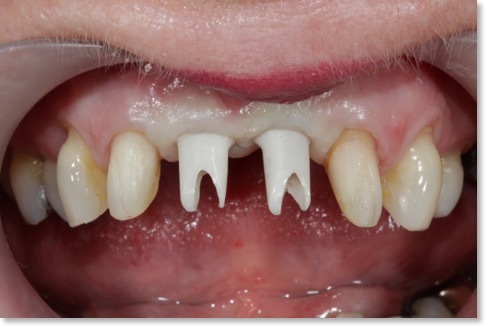 The front teeth crowns were also replaced. 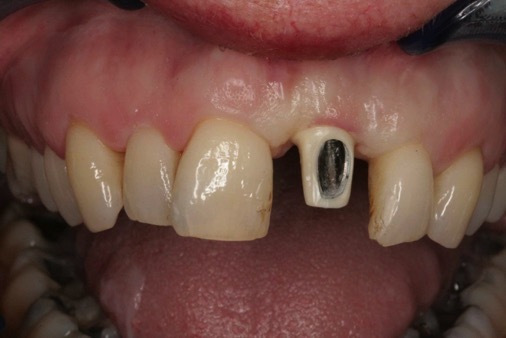 This full mouth x-ray shows the upper implants placed as well as new bone grown by the sinus grafting technique. 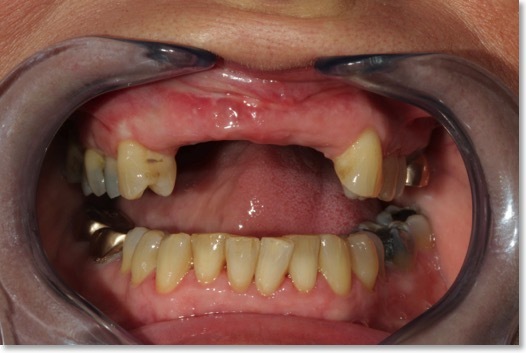 In sinus graft cases it is usual to use one implant per tooth for additional strength. 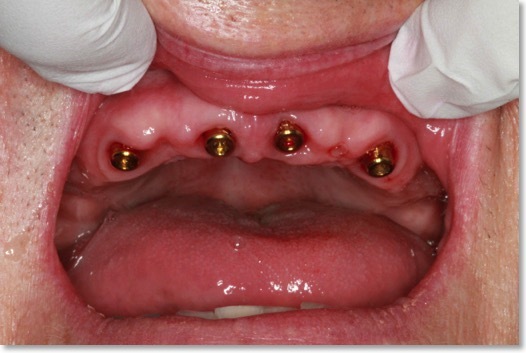 This picture shows the titanium abutments fixed to each implant shortly before the fixed teeth are permanently bonded into place. 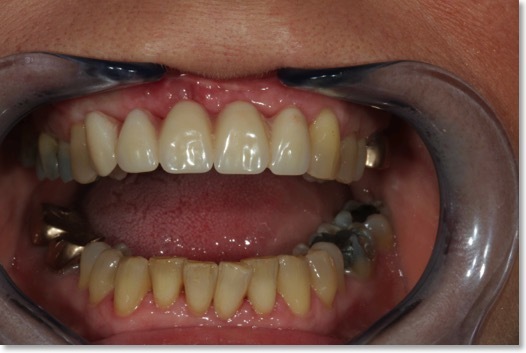 Here the new crowns have just been fitted on the upper teeth along with the new implant bridgework at the back of the mouth. The look of the final smile mimics the original but with a new fresher look. 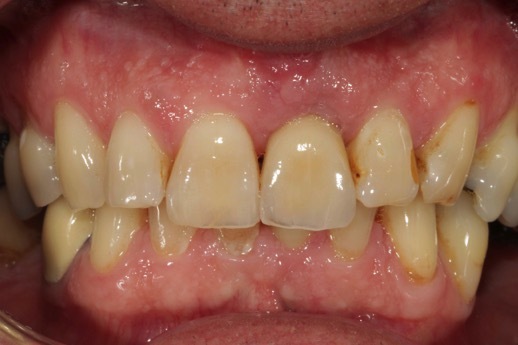 Overall treatment time was 12 months from start to finish. 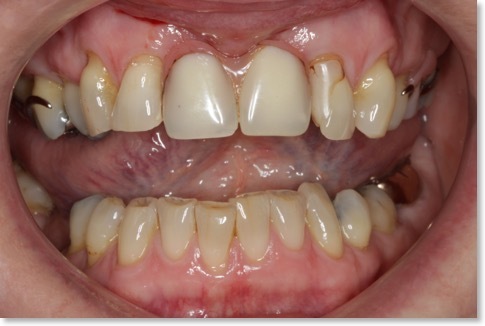 Because infection was present, the teeth supporting the bridge had to be removed and initially a temporary denture fitted as seen above. 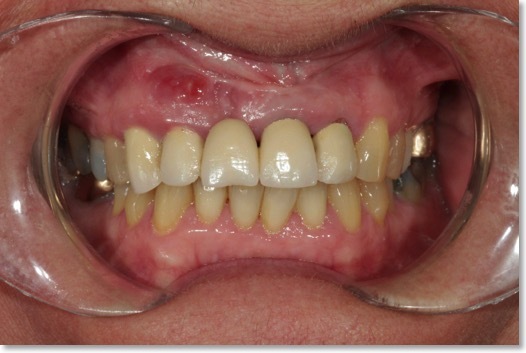 This was in place for a couple of months before the gums had settled enough to allow 2 dental implants to be placed. 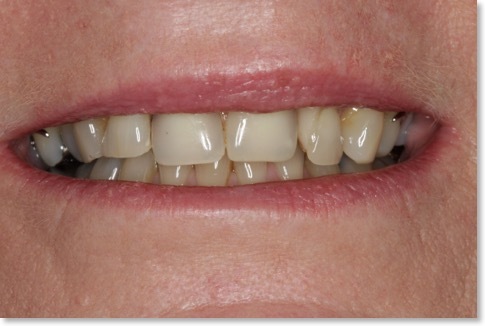 The starting point here was a set of failing upper natural teeth that had become loose over the years. 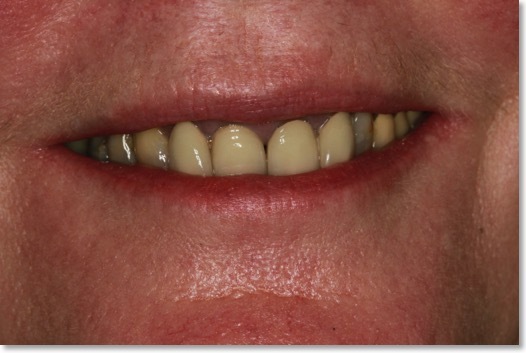 The patient wore an ill fitting partial upper denture so was accustomed to the feel of a denture in her mouth. 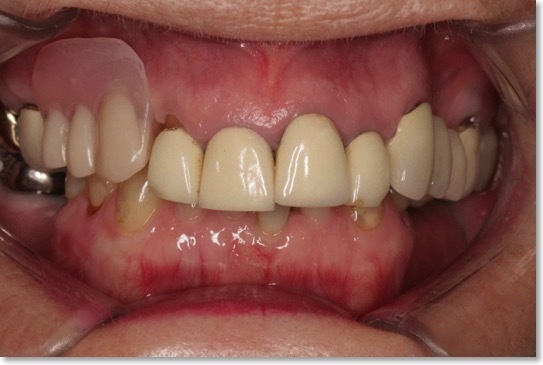 Implant over dentures work best in patients that have some experience of wearing even a small plate initially.